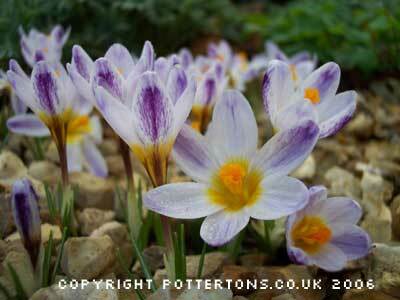 Generally all require a sunny position in well drained soil. 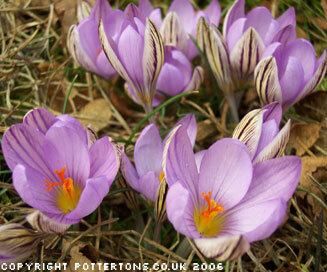 They flower from early February to late March and suit planting situations throughout the garden. Most are very free flowering & long lived. 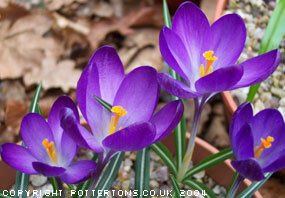 Plant the bulbs about 7cm deep. 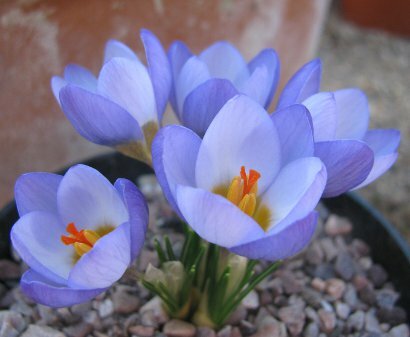 Just about the earliest species Crocus to appear in our garden which means it has to withstand some pretty aweful weather. 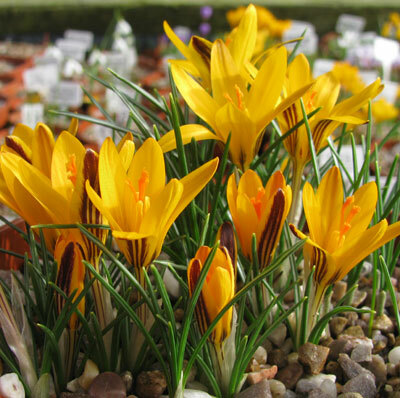 Each bulb produces several deep orange flowers, up to about 5cm tall. A tough 'un. 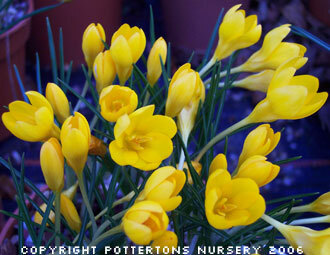 Golden-yellow flowers bronze tinged outside, a very free flowering species. A delicate, fine narrow pure white flower. 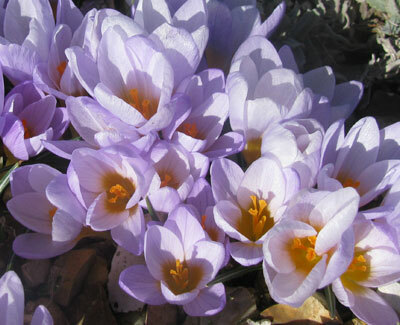 Soft-yellow to light bronze petals with a soft-purple feathering on both sides of the outer petal, bronze basal-blotch. The brightest yellow chrysanthus with pointed petals and three to five short purple stripes on the bases of the outer petals. Beautiful delicate soft blue flowers veined lightly with violet, one of the most outstanding garden varieties that is now regret rarely offered, limited availability. 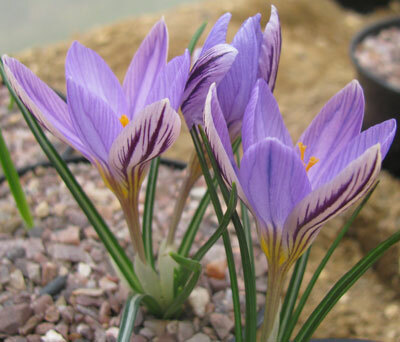 Selected and originally raised at the nursery, this stunning Crocus has typical bright orange petals which when open reveal a stunning black central style. Fully hardy for trough, raised bed or rockery. February to March. A recent new introduction selected by the famous Dutch grower Mr. P.B. 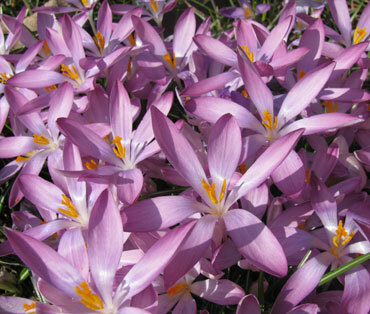 van Eeden this form of chrysanthus has plant is large flowering, light purple with paler centre. 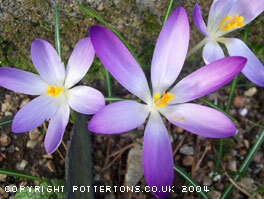 One of the prettiest dwarf species with pale creamy flowers feathered purple in February to March, 7cm. A selected clone of great merit with large mid lilac-blue flowers, faintly striped on the exterior. A robust flowering form but only 5cm tall. 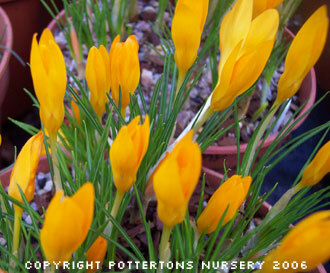 Dark orange-yellow flowers of substance in February. 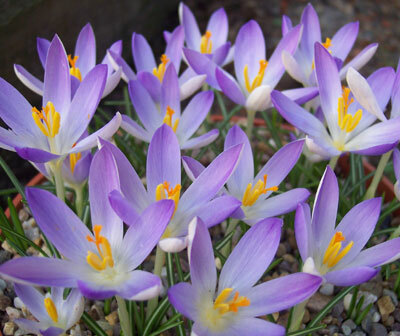 A good Crocus for naturalising as it produces a wealth of seed to form large colonies in time. 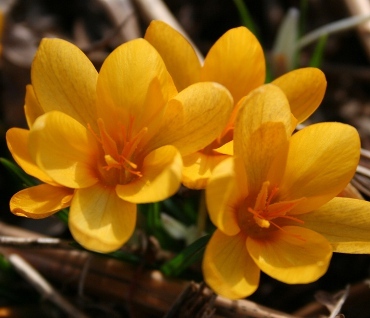 An unusual flowering Crocus with starry white flowers, yellow base and deep orange -red style branches to10cm from January to March. Naturally small bulbs. 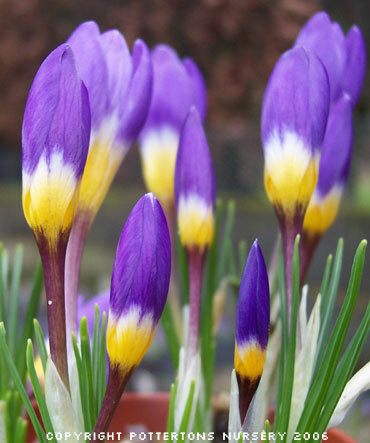 Rich violet on the inside and yellow to buff on the outside petals, violet striping on the back. 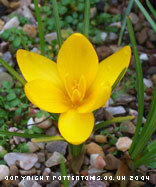 Very large golden-yellow form with slight bronze feathering on the outer petals. A strikingly beautiful, solid, robust flowering form. 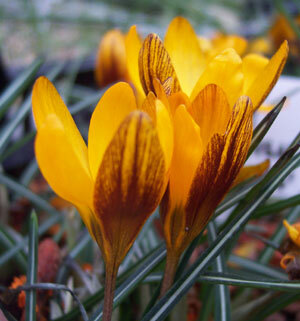 Orange-yellow flowers with bronzy-brown featherings on the outer of the petals, a sturdy Crocus that will naturalise in grass. A very distinct bloomer with inner petals light violet, outer petals heavily feathered glossy purple, yellow inner throat. A sturdy species. 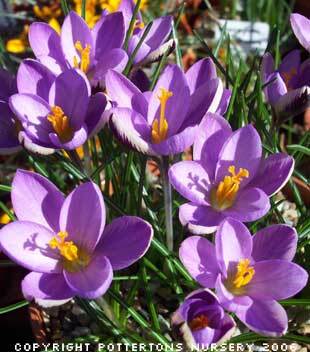 Light purple petals inside with a cream or buff exterior, flowers lined and feathered in purple, a lovely vigorous, early flowering species. Very distinct deep purple fls blotched with white at tips, with a long flowering period. 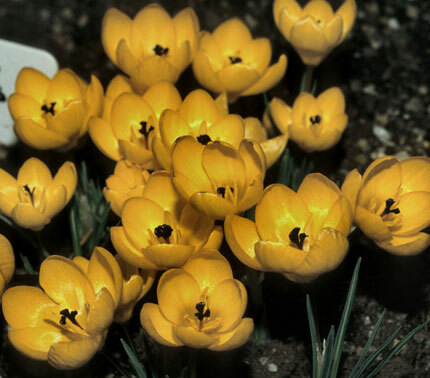 Outer petals are nearly white, inner petals mineral-violet, yellow base. 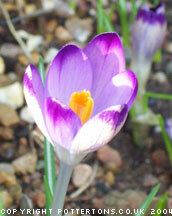 An easy robust free-flowering & popular choice that always stands out in our garden despite the inclement March weather. Very beautiful form with three distinct bands of colour in the flower in successive layers - lilac, pure white and golden yellow. 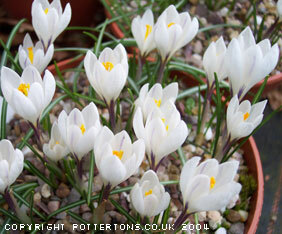 A beautiful distinct form, white to pale lilac petals with very dark feathering on the outside. Limited availability. 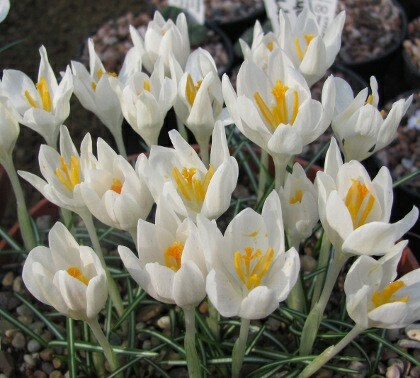 An excellent robust white flowering form of tommasinianus which produces numerous, sturdy white flowers in February and March, very distinct. 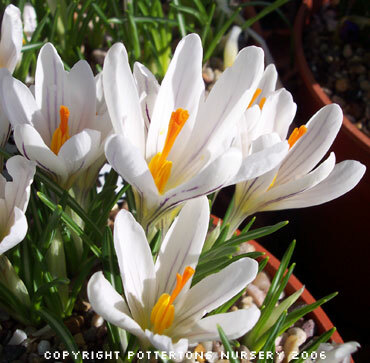 Large pure white flowers with a hint of purple dots on the outer petals, often with 8 petals. Limited availability. 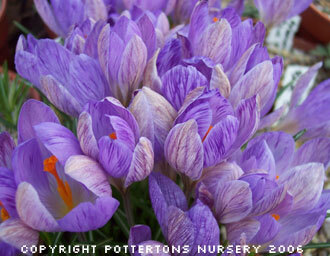 Yes this is a real beauty with very large violet flowers on the interior petals and lighter soft lilac on the outside. Lovely. Large lavender flowers with striking dark purple tips, naturally small bulbs, our stock has been vigorously sorted to ensure true to name. An outstanding and justifiably popular form with numerous large, bright rose-pink flowers, that are silvery-grey outside. Fairly large deep violet-purple flowers in great profusion. Another good form for naturalising with many strong reddish-purple flowers. 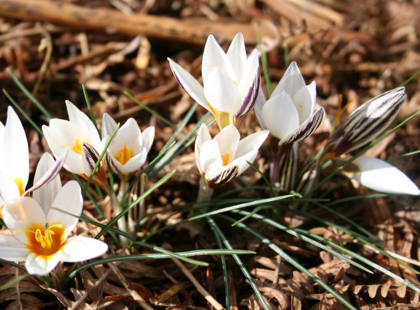 Small white flowering form of Crocus vernus native to the high pastures of the Alps, March/April. 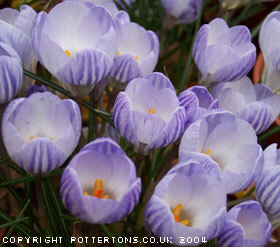 A beautiful variety, white flowers with striking purple stripes on the inside & outside from February to March. 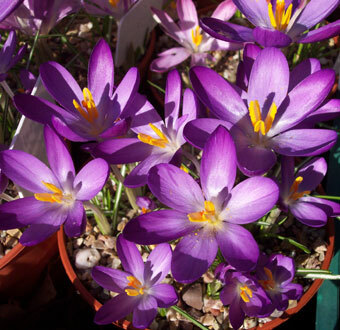 Large orange-yellow flowers sometimes marked purple-brown on outer petals are sweetly scented. Native of Turkey, Syria and Lebanon, some protection may be required depending on your location but a robust grower in our nursery.